No matter your background, you can train to the high standards of the Ardenna Flagship Program, then enjoy cruising her on your own or with other graduates throughout the Salish Sea and the Inside Passage. Ardenna is a coveted Sabre 402 - with quality and maintenance well above the norms of charter and club boats. 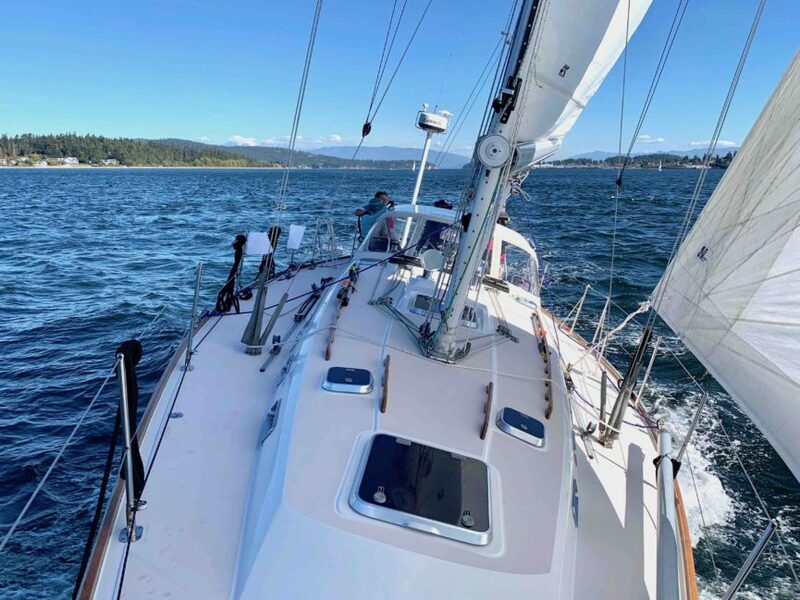 Exclusive to Ardenna Flagship Program Graduates, this is your cruising sailboat on the Salish Sea, with increasing permissions as you train through the three levels. Membership in this "Graduate Program" commuity is based only on your training; there are no initiation fees or dues. Just pay one flat low daily rate for your cruising days. In a culture that favors instant gratification and easy access, the natural world is uncompromizing. The Salish Sea and the Inside Passage are some of the most challenging cruising grounds in the world. Skilled cruisers are rewarded by spectacular wilderness and wildlife. The Ardenna Flagship Program is designed to provide the skill development needed for anyone to meet these challenges and access these experiences safely and with confidence. 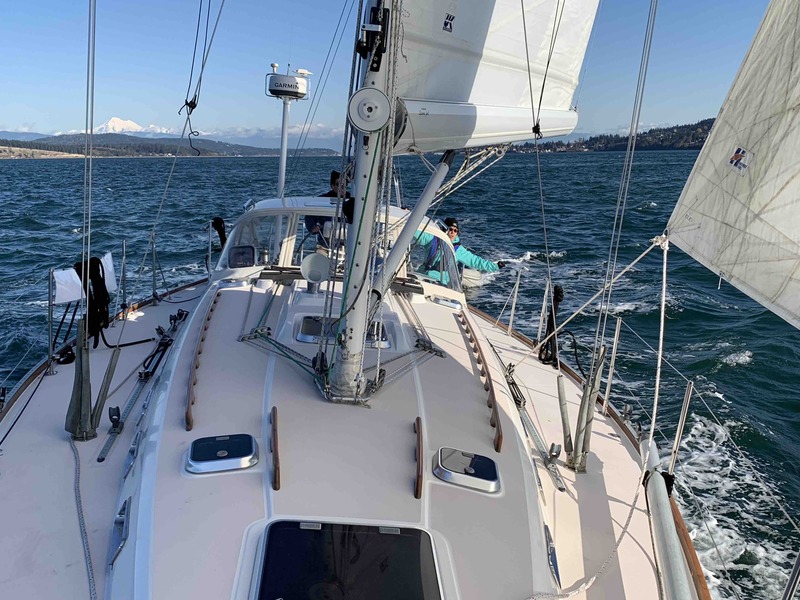 There is a higher level of cruising joy that comes with real abilities to operate in the highly dynamic geographical, weather, tide and current environment of the Northwest. 4 full days of immersive learning aboard Ardenna. Plan to stay on the boat each night. Sign up individually for a pre-scheduled class or contact us to custom schedule a class for your family or group. Additional instructional days available if needed. Need more instruction & coaching? Additional instruction days available for a group rate of $900/day for up to 4 people. 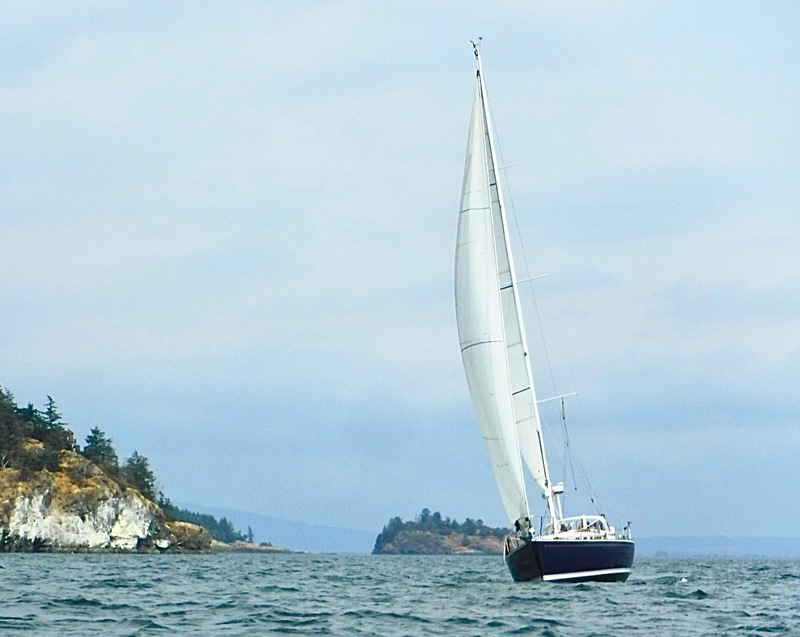 Sail Ardenna independently for 1-3 day cruises on the Salish Sea. At least two Level 2 graduates, and bring up to two guests. Cruise with up to 6 Shearwater University graduates from any class. 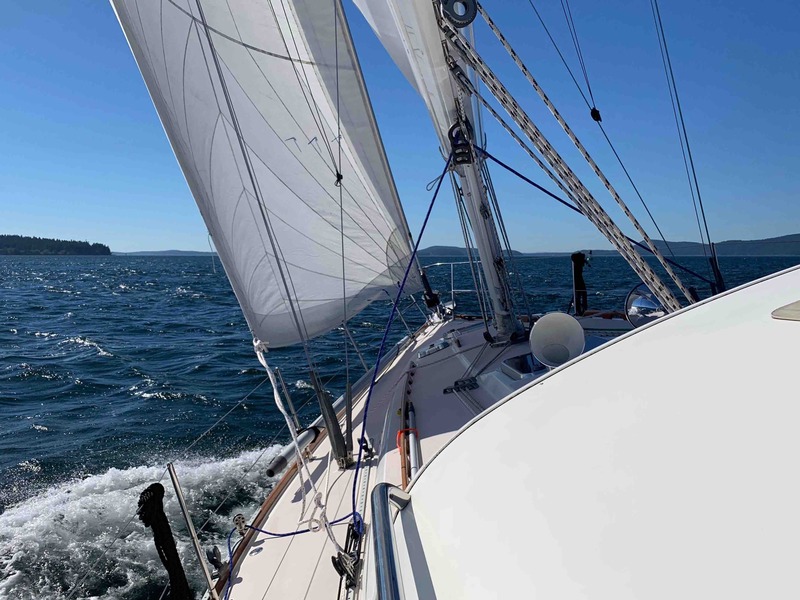 One continuous week immersed in advanced cruising skill development in the San Juan Islands and the Canadian Gulf Islands. Once you have completed this final level, your horizons truly expand. Seven full days of cruising and training on both the US and Canadian Salish Sea. Apply your Coastal Navigation skills skills to the very real challenges of the Salish Sea. Earn the internationally recognized US Sailing Bareboat Cruising Certificate, qualifying you for charter cruising throughout the world. Ardenna is now your cruising sailboat for all the horizons of the Salish Sea and the Inside Passage. Enjoy week long cruises or more. For those with prior cruising skills and experience who want to join the Ardenna Flagship Graduate Community, this is your custom crossover option. Contact us to begin your custom program. Your program length will depend on your background and needs. Scheduling is custom and Tuition is "per day", for up to 4 students on the boat. For any of the skills you need more help on, outside of the scheduled class days, just add one or more days. This is a group rate, inclusive for up to 4 students on the boat. 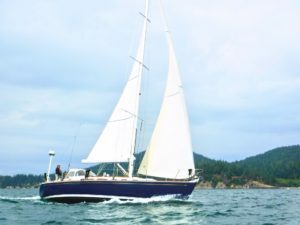 Ardenna is your cruising sailboat on the Salish Sea and beyond! Your independent cruises aboard Ardenna will be in accordance to your program certification level and through mutual consultation on your readiness. Individuals and couples are encouraged to join with others in the Ardenna Graduate Community to share skills, crewing, and expenses for cruises, especially as you are gaining experience and expanding your skills. There are no initiation fees, dues or other overhead costs for graduate rentals. It's pay as you go. Each individual graduate participating in rentals must have a damage deposit on file for the duration of their rental program participation. This deposit will be equal to 1/2 of the current insurance deductible for the boat. At a minimum there must be two Ardenna Flagship Program graduates on board for each rental, with qualifications equalling or exceeding the certificatoin reqiurements for the type of cruise. Up to 2 guests may be included on the rental cruise. Up to 6 Ardenna Flagship Program members may be aboard for a cruise, so long as at least 2 of them are qualified for the cruise type. An Ardenna Flagship program rental contract is required on file prior to rental for each graduate. Shearwater University commits to maintaining Ardenna in top functional and aesthetic condition for all of her systems. Shearwater University will pay for all moorage, insurance premiums and routine maintenance for outstanding performance of the vessel. Ardenna Flagship Program members rent Ardenna "as if she were your own". That means treating her with TLC during your cruise, bringing your own provisions, linens, and other cruising luxuries, and cleaning her thoroughly after your cruise (including pump-out and fuel-up). This program is simple an affordable. it is pay-as-you-go and first-come-first-served. Everyone must watch out for Ardenna's well-being, and report any damage or maintenance fees. There is a a"code of trust", without which this program breaks down. That's it. For a day or a week or more.